Moroccan Tagine of Lamb or Beef with DatesMoroccan Tagine of Lamb or Beef with Dates. This easy Moroccan tagine features meat cooked until tender with saffron, ginger, and pepper, which is then topped with soft dates in a cinnamon-flavored syrup. Sesame seeds and fried almonds are traditional garnishes, and Moroccan bread is served alongside for scooping everything up. 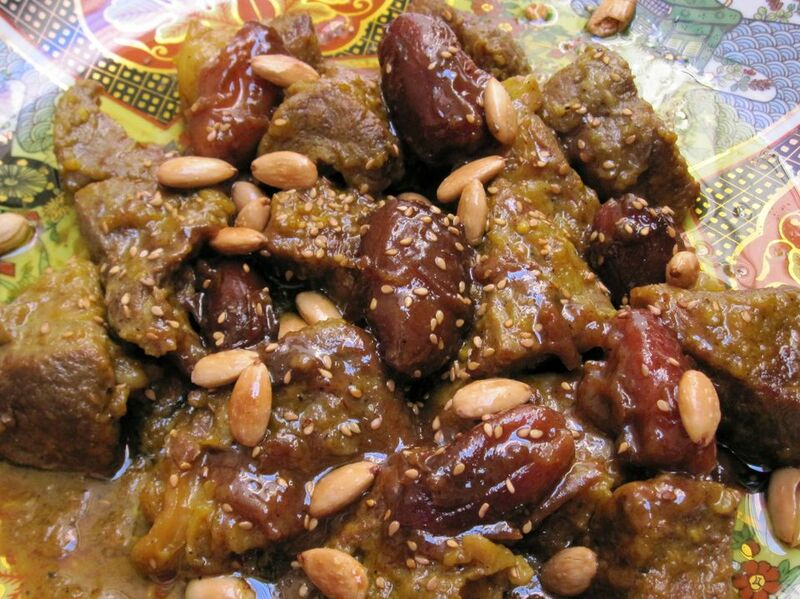 Medjool dates are recommended for this dish, but other firm, chewy dates can be used. Ras el hanout (a Moroccan spice blend) and white pepper are optional seasonings. You can make this recipe in a pressure cooker, a conventional pot, or a traditional ceramic or clay tagine. The cooking times will vary depending on which method you use. Add 2 1/2 cups of water and the cilantro. Over high heat, bring the meat and liquids to a rapid simmer. If using a pressure cooker, cover tightly and continue heating until pressure is achieved. After the meat has cooked, release the pressure and reduce the sauce, uncovered, until it is mostly oils and onion. If necessary, add a small amount of water during cooking to prevent the meat from scorching. When the meat has cooked, reduce the sauce until it is mostly oil and onions. Slice 1 of the onions into rings instead of grating it, and layer the onion rings on the bottom of the tagine. Mix the meat with the grated onion, garlic, oils, and spices, and arrange the mixture on top of the onion rings. Add 2 1/2 cups water, cover, and place the tagine on a diffuser over medium-low to medium heat. Allow the tagine to reach a simmer (this may take a long time), and then reduce the heat to the lowest temperature necessary to maintain the simmer. While the meat is cooking, remove the pits from the dates. Put the pitted dates in a small pot with the liquids reserved from the meat. Stir in the sugar and cinnamon, and simmer the dates gently for 5 to 10 minutes, or until they are sitting in a thick syrup. If desired, garnish with sesame seeds and/or fried almonds.